I’m performing a few finishing touches on another soon to be released book. I am planing to release this book within a week. The Franklin Mint issues have been previously integrated into Hawaiiana numismatics. There are a total of 36 medals and 12 ingots cataloged in the book Hawaiian Money Standard Catalog “Second Edition”, 1991, by Medcalf & Russell (MR91). In performing the research for this book, I uncovered a total of 73 Franklin Mint medals relating to Hawaii. These additional 37 medals are not generally known by the Hawaiian specialist and are often overlooked and not collected. I’ve also uncovered a total of 25 Franklin Mint ingots. These additional 13 ingots are also not generally known by the Hawaiian specialist and are also overlooked and not collected. This book fills the knowledge gap about the previously undocumented Franklin Mint issues relating to Hawaii and catalogs the 73 Franklin Mint medals and 25 Franklin Mint ingots . 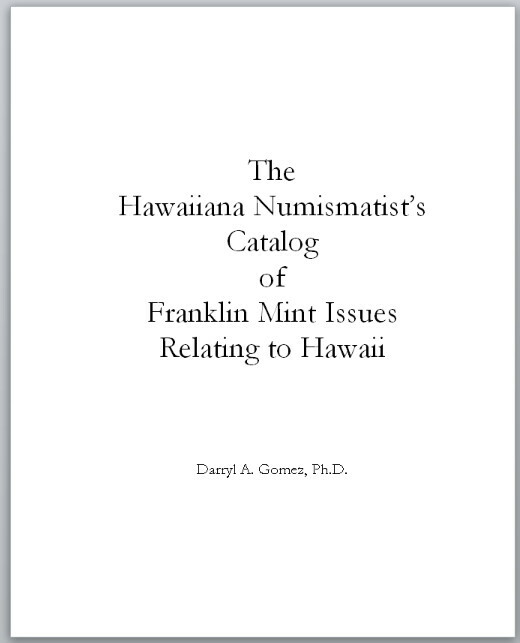 This book also provides additional information that is helpful to the Hawaiiana numismatist, such as images, mintages, cross reference to MR91, and identification of the source set of the medal or ingot of interest.